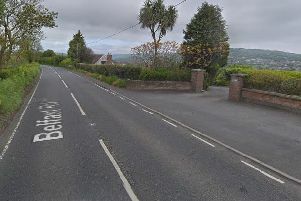 Larne sixth former Kieran Thompson gave the bus a miss to cycle to school in Ballymena from his home in Ballygally recently. Kieran, a pupil at Slemish College in Ballymena, took on the Shane’s Hill challenge as part of an £800 fundraiser towards a house building project in Zambia. He is part of a 17-strong group from Slemish College which is preparing to visit Ndola in July. To date, he has raised over £250 sponsorship from school friends, family and neighbours. The group is aiming to raise a total of £12,000 to build four new homes for families currently living in shanty accommodation. The team, led by vice-principal Michael Bennett, will be travelling to Africa with international charity “Habitat for Humanity”, a non=profit Christian movement dedicated to eliminating sub-standard housing and homelessness. Founded in 1976, the agency currently works in 70 countries and has served more than one million families.